This is so comfortable and I am sleeping better! This high quality Cheer Collection down alternative J-shape pillow will indulge you with incredible warmth, loft, comfort and coziness. This extraordinary pillow surrounds you in a cocoon of support, relieving pressure to many areas of the body, which drastically reduces your need to toss and turn. This Body Pregnancy Pillow is a full-body solution for expectant mothers and will support your back preventing sciatica and lower back pain. It also tucks between your knees for help with back pain and temperature control, while cradling your belly. I have back pain and often sleep with a pillow between my legs. This pillow is so much more comfortable and I have been waking up without pain for over two weeks. The white cover comes off so it is simple to wash so that helps tons since I have caught my dog curling up inside this pillow too :) So far this pillow has been holding up with daily use and I have had it about a month. This body pillow offers nice quality at a good price. I wanted to try a body pillow to address issues with numbness in my shoulders and soreness in my hips. This body pillow helps with both. While I don't shift around as much during the night as I used to, I still do flip from side to side. This pillow is not too cumbersome and permits some free movement. Overall, a good purchase. I have been searching high and low for a body pillow for my wife whom is pregnant. She loves this pillow, says she feels like her body is in place. I promise, she went from tossing and turning to sleeping like a baby. The way it wedges between her knees helps support her spine. Wife is one happy pregnant woman. And that is a good thing. She is 5 months . When she is done with pillow, I'll take it. Haha. Possibly my Favorite Thing, ever. After about two weeks use, it's downy-soft and cozy, but incredibly supportive. Perfect for side sleepers - you don't have to be expecting to appreciate. Usually struggle to find a comfortable spot - can't find an uncomfortable spot with this pillow, can even sleep on my back comfortably. Tried many types of pillows - buying another one of these! 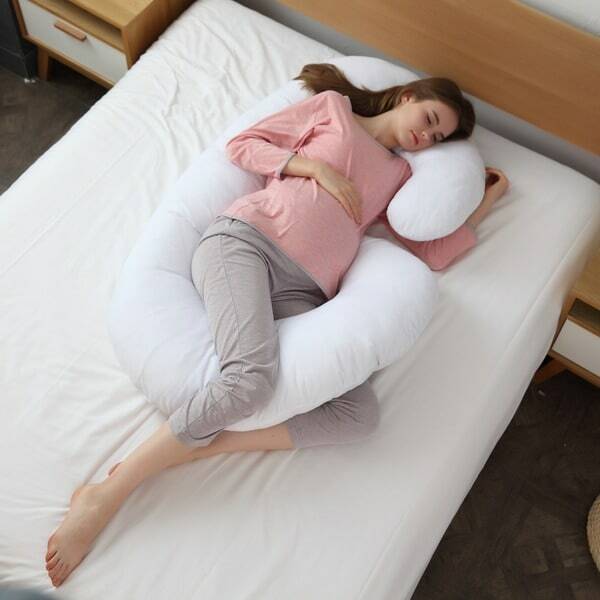 Pregnant or no, t this pillow helps anyone who just can't get comfortable while sleeping. Bad knees, sore back, arthritis or edema this piloow is completely versatile and easily folded, bent and manipulated into the perfect configuration.for your needs. Better than just the "L" shape, this is a complete body hugging pillow. I highly recommend this pillow for anyone who needs help getting comfortable during sleep. I love it!!! It's so comfy, soft, and supportive to the areas of your body where you need it the most. Great buy!!! LOVE IT I high reckmend the J Pillow for very one with dack problems. Didn't enjoy this product at all was very rough material. Not soft inside material either. Super comfy. Glad I bought it. My kids who have sensory issues *love* these pillows, helps them sleep better.and the cover is necessary for cleanliness. It holds up under frequent washing and is fairly soft. Good product. Best purchase I have ever made! I love this pillow. It provides the support and comfort that I need. I recommend this product to everyone. It was packaged well and arrived right in time. I am thinking about buying another one to use when traveling! This pillow did not have very much filling. It was not as comfy as the picture would imply. I like it a lot but it's a little smaller than I thought and coiled a little tight for me.I like my bigger one better and next time I'll go back to that. Just personal preference. I did not really like the way the "J" part wrapped around so much. I have not used this and feel like it was a waste of my money. I was very disappointed. Sorry! This pillow really helps my pregnant wife sleep. This pillow can be a real comfort to someone who is pregnant or has back problems or maybe has had surgery, only downside is that it is so gigantic , it can be cumbersome to deal with. I love this pillow! I'm not preggers but I am a side sleeper and it helps me wake in morning without neck and shoulder pain!! The only thing I use the pillow for it twirled around in a circle to sit up in bed. Trying to "get into" the pillow to sleep requires quite a lot of effort, and then, for me, is not comfortable. I am not pregnant, however. I bought two of these. One for myself because I have back problems and one for my pregnant daughter We both love them and they really help us get a better nights sleep. "Is the filling more like a foam or a feather filling?"